What if there was a button you could push that would instantly transport you to a dinner table surrounded by your best friends in the world? What if that same button could help you be a better cook and learn a new language? And what if that button could help you stay in shape and save money? You’d probably be wringing your hands together Gollum style trying to figure out just how far you’d go to get the button. What if I told you that you can have it, and probably already do, for free? The magic button I’m talking about is the Subscribe to podcast button in iTunes (or Stitcher, or anywhere you can play podcasts). 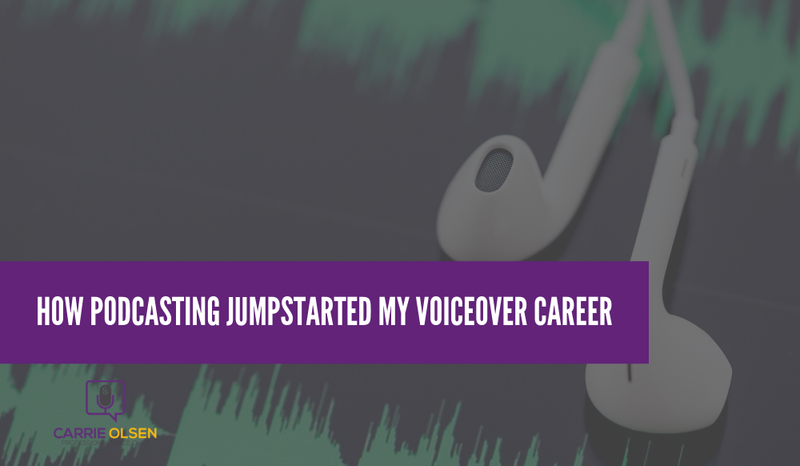 If you’re familiar with my voiceover journey, you know that I first learned about voice over when voice actor, Alyson Steel, was interviewed on the Go For It Show podcast with Tysen Webb. You may also know that my husband and I had a podcast of our own before I started doing VO, which is why I didn’t need to buy recording equipment before I started auditioning. But what you probably don’t know is just how far back me and podcasting go. Or just how big of an influence it has had on my life. It’s big. In 2011 my husband, Derek, started a financial coaching business. He was a big fan of Dan Miller’s podcast, and he wanted to have a podcast to complement his business as well. But he had no idea how to do it. Enter the Podcast Answer Man. We actually heard about The Man, Cliff Ravenscraft, at an event we went to at Dan Miller’s house. But at the time, he was just a name. We had no idea that he would become a part of our story. When Derek set off to start his podcast, he remembered Cliff (or maybe he just Googled “how to podcast” — Cliff is the first result to show up), and went to his site to learn how to set things up. After Derek went through some of Cliff’s free resources, he had a podcast. Thus began our love affair with podcasting. In 2012, I started watching a show called Downton Abbey. I had been listening to several other podcasts, and I searched iTunes to see if there was a good podcast dedicated to Downton Abbey. There wasn’t. So one day, while Derek was working, I got out his podcasting equipment, sat down in our apartment, and recorded my first podcast episode: The Downton Abbey Reflection. It was a lot of fun, so I kept it up. I didn’t publicize my podcast to anyone, but quickly people started to find it and subscribe. I was floored by how many downloads it was getting! Later that year, Derek got to meet Cliff in person at a workshop for aspiring speakers. He told Cliff about how much we’d learned from him and mentioned my Downton Abbey podcast in passing. He had no idea that Cliff and his wife were huge fans of the show. That simple conversation set our lives down a course we could not have imagined. Around November of 2012, Cliff let me and Derek know about a client of his who was starting a new project. He recommended us specifically for the project because of my Downton Abbey podcast. I won’t get into the details of the project, but Derek and I made over a combined $50,000 over the next year and a half from this project working on podcasts (Did I mention that I’m glad Derek mentioned my podcast to Cliff at the speaking event?). As a result of all of this podcasting, Derek and I joined several podcasting groups on Facebook. One day, someone posted that we should all try listening to a fellow member’s podcast that we had never listened to before. I randomly picked Tysen Webb’s podcast and downloaded the latest episode to my iPhone so I could listen on my way to work. I have to emphasize that I picked Tysen’s podcast randomly. I also have to emphasize that the episode I listened to just happened to be the latest one. I didn’t pick it based on subject matter or anything else — only the fact that it was the most current. But that podcast episode changed my life. Alyson Steel was Tysen’s guest. And after I heard her interview, I hired her to be my voice over coach. I had never even heard of voice over before. Well, I’ve told the rest of the story many times. I started coaching with Alyson, I started getting jobs within weeks. I booked a national radio campaign, and within four months I quit my job to do VO full-time. And here we are. I still look in awe at the chain of events that led me to here. But there are two things that this story reminds me of every time I tell it. Podcasting is amazing. Truly. Even if you never have a podcast of your own or it doesn’t impact your life as obviously as it has mine, it can still open up new worlds for you. I challenge you to head over to the iTunes store and find something new and amazing. Let me know in the comments what your favorite shows are and why. We need community. My story is comprised of many twists and turns, and at each one of them is a person who, whether they knew it or not, played a huge role in it. For me, those people are Alyson Steel, Tysen Webb, my husband, Julian Fellowes (yes, I credit the creator of Downton Abbey), Dan Miller, and of course, Cliff Ravenscraft. I love thinking that as I grow my business and share what I’ve learned that I’ll get to be a part of someone else’s story in the same way these people have been a part of mine. 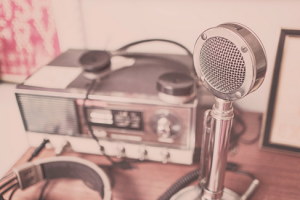 If you’re a voice over talent, or are aspiring to be one, podcasting is a great way for you to hone your microphone and recording skills while getting your voice out there and having fun. It’s so simple to start your own podcast — you can do it from your bedroom if you like. If you’re thinking about starting a podcast on voiceover, or anything else, check out Cliff Ravenscraft’s awesome resource page. He provides a lot of useful information about everything you could possibly need to get going, from equipment to getting your website set up. His podcast is also extremely helpful (as you might have imagined). You can search it to find an episode that is relevant to your current situation. And if you’re serious about getting a podcast up and running and doing it right and doing it big, you can register for his course, Podcasting A to Z.
I would love to see a network of voice over podcasts being started that showcases a broad range of VOs. Be sure to let me know if you decide to get a show up and running so I can promote it!